The harsh conditions of winter can wreck havoc on your skin. I start to feel it immediately in my hands beginning in mid-October. As the winter months trudge on, my skin becomes more and more dry, flaky, and crackling. It's a challenge to find a lotion that works well for my hands AND for my body. What works for my body is often too greasy or too sticky for my hands. It's seems to be a constant battle and one that I would prefer not to fight. As a member of the Viewpoints Blogger Review Panel, I was invited to take part in a lotion showdown. Viewpoints pitted Aveeno Skin Relief and St. Ives Naturally Soothing lotions against one another, and asked its bloggers to put each lotion to the ultimate test. Although Aveeno is a highly trusted name in skincare, I tried to go into my testing with an open mind. I used both lotions for a 14-day period. 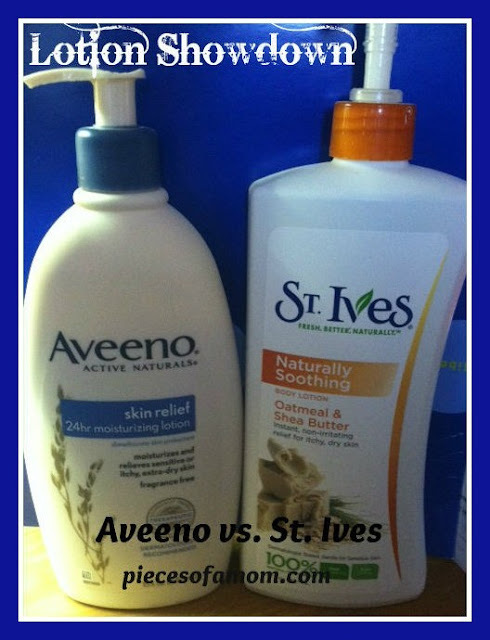 I applied the Aveeno on the right side of my body and the St. Ives on the left side of my body for the best comparison. The first thing I noticed was that both lotions were equally effective. Both kept my skin moisturized for beyond 12 hours and usually up to 24 hours. I wasn't itching and my skin felt soft and smooth. There's no comparison here. St. Ives wins hands down. The scent was light, not too fruity or flowery. It left no trace of a scent hours after you've left a room the way many scented lotions often do. It had a faint smell of oatmeal and butter, which is a nice combination. The Aveeno takes the cake here. It seemed to seep directly into my parched skin and didn't leave behind a sticky or pasty feeling. Whereas the St. Ives wasn't necessarily greasy, but it left my skin feeling wet as if the lotion was just sitting on the surface of my skin rather than being absorbed into it. The Aveeno retails for about $9 per 18 fl. oz. bottle. The St. Ives retails for about $4.50 for a 21 fl. oz. bottle. Big difference for lotions that are relatively similar. This was a tough decision. I liked both lotions, but in the end, I have to go with Aveeno, primarily for its excellent aborption. But I have to say that I am not thrilled by the scent. While it's not overwhelmingly bad, it's just bland and blah. If you're on a tight budget, stick with the St. Ives. If you are in the mood to splurge a bit, spring for the Aveeno. Either way, you won't be disappointed with either lotion! Disclosure: Viewpoints provided me with 2 bottles of lotion to facilitate this review. All opinions are my own.